Winter driving hazards can be distracting and dangerous on occasion. You have to be vigilant and aware anytime you get behind the wheel of your vehicle. The good news is that highways and major roads are the first priority to be cleared by the snowplows after a significant snowfall. The not so good news is that it slows down and blocks traffic so they become a winter driving hazard. 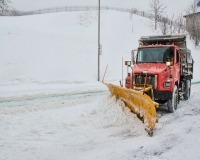 Passing snowplows and salt trucks are sometimes out in twos or threes that span entire lanes of the highway. It's a fact of winter life, very necessary and frequently done. Give them lots of room to pass them if you can. These trucks also travel at a much slower speed so traffic will back up behind them until you can either pass them or they pull off of the highway, which ever comes first. Also remember the trucks that are spreading salt or sand everywhere will take a toll on your vehicle. As part of your regular car maintenance, get your vehicle washed at regular intervals throughout the winter. High pressured water from these car wash stations will help reduce the salt build-up that can cause corrosion around the more vulnerable areas of your vehicle. Also having your vehicle oil-undercoated on a regular basis (every one or two years) will prolong the life of your car. It will help prevent debris and crud from building up and damaging the undercarriage and as well as rust spots from forming. One of the most common winter driving hazards is passing these huge semi-trailer trucks on the roads and highways. This common event is anxiety causing in even the best of weather to many drivers, more so in winter. Passing one or many of them in snowy or icy conditions is more problematic and can be edge-of-seat driving for the average car driver. The huge amount of spray thrown up from these multi-wheeled behemoths can cause mini-whiteouts for several seconds before you are able to see properly again. Just stay focused on your driving and the lane you are in and most of all, don't panic. The spray will clear soon enough. Be very careful passing them especially at night when visibility is low for both you and the truck driver. Driving at night in winter on a long distance trip certainly has more risk to it. The risk is multiplied by just the sheer volume of truck traffic on the highways now as this is the main means of transporting goods. Depending on the time and day, truck traffic can be truly horrendous so choose your departure carefully to avoid this situation if you can. Truly a round-the-clock winter driving hazard of sometimes epic proportions. Driving in daylight is better naturally. Although on dark days you might argue this! If you can, try to do most of your driving in the daylight. Another winter driving hazard will be bridges and overpasses. You'll see road signs telling you bridges and overpasses are always slippery with ice or snow in winter. Pay attention because it's true! These structures get ice build-up more quickly on them before the road leading up to and away from it does. If you ignore the signs, you do so at your own peril. Use a slower speed and be careful as you drive across them. If you do begin to slide or skid, steer into the direction you are going, slow down even further by easing off the gas but don't hit the brakes. This will make it worse if you hit the brakes too quickly. Make only small, incremental changes to correct your direction to regain control of your vehicle. Sometimes, this will be a road condition known as "black ice" where ice forms on the pavement. You can't actually see it until it's too late to avoid it unfortunately. By then your vehicle will likely be sliding so repeat the steps above. The road pavement suffers a lot during winter with the freeze/thaw cycle of the ground beneath. The usual results are breaks, cracks and potholes that appear all too frequently on highways, roads, and streets. Driving through potholes can damage your vehicle (wheels, rims and idler arms in particular). If you can't avoid it altogether, it's best to slow down to a almost crawl as you drive through them. Damage to these parts of a vehicle can be very expensive to repair or replace. Highways have solid wide shoulders to stop on if you absolutely have to although it's way better and safer to get off at the next exit. However, country roads generally only appear to have wide shoulders but in fact, the shoulders are quite soft and tend to slope away. The large snowplows scrape the snow beyond the edge of the paved road leaving a wide white expanse. However, what may look like flat solid ground to pull over on or do a U-turn, may not be at all. The snow level disguises the fact that there's a sharp drop-off so there's a distinct possibility that you'll end up in a ditch instead. Choose a safer spot to stop or change direction like a driveway or businesses with a car parking area. There are other winter road dangers that you also need to know about. then there's driving safely in winter and as well as what other kinds of winter driving challenges you might find over the course of the winter.